Universal Design | Accessibility and play | KaBOOM! Universal Design is a set of seven principles developed at the Center for Universal Design at North Carolina State University. Beyond simply providing access to people with physical disabilities, Universal Design envisions solutions that accommodate as many people as possible. The principles of Universal Design consider young and old, right- and left-handed, people with children, and the elderly. The principles responded to several movements: increased independence and purchase power among people with disabilities, an aging global population, and the inadequacy of adaptive/assistive technologies. The 7 principles of Universal Design. Child development experts agree that unstructured play is critical to the development of all children. 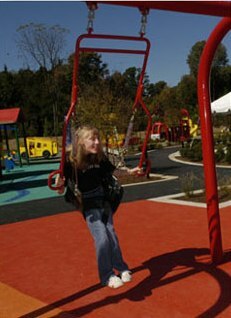 In playspaces incorporating Universal Design (UD), children of all abilities play together, independently. The goal of a universally designed play environment is to provide all children with sensory-rich and engaging play opportunities in a barrier-free environment. In UD playspaces, children can use their typical means of mobility to access a minimum of 70% of the play activities. Floor-level play goes beyond the basics of the Americans with Disabilities Act guidelines and elevated play areas include a ramp or lift to provide access for all. Other considerations may include a playful color palette that is not over-stimulating, the use of natural light, and a sensory room that provides a quiet space for children who might get overwhelmed during play. When designing your playspace remember that children need a variety of types of play to develop the wide range of skills they will need to be successful in the world. These include big muscle play, manipulative play, pretend play, creative arts play, sensory play, and quiet play. Often outdoor playspaces provide only opportunities for big muscle play and some sensory play, but it is important to make sure that these other types of play also flourish in outdoor environments. Adelson, Rachel. (Oct-Dec 2004). Universal Design: Opening every door. Inside MS. 22/4, 30-34. Doctoroff, Sandra. (Dec 2001). Adapting the physical environment to meet the needs of all young children for play. Early Childhood Education Journal. 29/2, 105-109. Goltsman, Susan. (2001). Universal design in outdoor play areas. Chapter in Preiser, Wolfgang and Elaine Ostroff. (2001). Universal design handbook. New York: McGraw-Hill Professional. Covington, George and Bruce Hannah. (1993). Access by design. New York: Van Nostrand Reinhold. Goldsmith, Selwyn. (2001). Universal design. Oxford: Architectural press. Hardie, Graeme, Ron Mace, and Jaine P. Place. (1990). Accessible environments: Toward universal design. Raleigh: Center for Universal Design, NC State. Lebovich, William L. (1993). Design for dignity: Studies in accessibility. New York: John Wiley & Sons, Inc.
Norman, Donald. (1988). The design of everyday things. New York: Basic Books, Inc. Play and Learning in Adaptable Environments, Inc. (1994). Universal access to outdoor recreation: A design guide. Berkeley, CA: MIG Communications (Pocket guide version also available). Preiser, Wolfgang and Elaine Ostroff. (2001). Universal design handbook. New York: McGraw-Hill Professional.